As we enter the world of detailed and substantive negotiations for Article 50, one of the more problematic issues is that of the Irish border. In this infographic, I’ve set out the key elements, as a quick reference. Comments – and solutions – most welcome. How about a hard border between Scotland and England? Pro-Remain Scotland, NI and the ROI all remain in the Single Market and the internal UK hard border between Scotland and England is easier to police than the problematic border between NI and the ROI that bisects many towns and villages. Wow. what happened? I thought comments – and solutions – were most welcome? Are there too many comments to moderate? Mine has been stuck awaiting moderation for almost a week. Apologies for the silence: our comment notification system isn’t working properly. The Liechtenstein system is an interesting one, since it does appear to offer a resolution. However, there have to be very serious doubts about whether it is scalable. In the Liechtenstein case, we’re talking about hundreds to low-thousands of individuals, many on daily/weekly commuting cycles, making up a quarter to a third of the local population, in an economy that is completely dependent on its neighbours. None of those elements really applies to the UK and it has non-trivial consequences for the rest of the Article 50 package. Where I think you are right to bring it in is with the reconfiguration of the various elements I listed in the original post: rather than seeing them as absolute, it makes more sense to disaggregate and find more blended approaches that speak to the various interests involved. Hi Simon, thanks for the response. Hmmm…I wasn’t thinking about the Liechtenstein solution for the entirety of the UK however. I was thinking about applying the Liechtenstein solution in relation to the trade in goods only (not the movement of people which is a different kind of Liechtenstein solution and is the popular (but I believe, unrealistic) solution promoted as a way for the UK as a whole to remain in the EEA). So yes, as you say it is to reconfigure various elements so that novel solutions are possible without falling foul of the no-cherry-picking rule (which is quite understandable and sensible). In this case it would just be a basic free trade agreement between the UK and EU (with the concomitant fall in services trade as that’s an area that FTAs are weak on, alongside the end of free movement) but with somewhat more free trade occurring between UK’s province of Northern Ireland and the EU. This in turn should allow the CTA to remain with regards to NI and Ireland, allow the UK to remain outside the Single Market and maintain territorial integrity insofar as customs borders are concerned for the UK. Well recently I’ve wondered if Liechtenstein’s solution to its own conundrum of being in the EEA and simultaneously in customs union with Switzerland (which was not in the EEA) would not be able to work…. Liechtenstein’s solution is something called “parallel marketability”. So Swiss law (for customs) and EEA law are are applicable simultaneously in Liechtenstein and where there is a conflict EEA law prevails but only in relation to Liechtenstein’s EEA partners. So the concept allows EEA products and Swiss products to circulate freely in Liechtenstein but not for Swiss products to enter the EEA (without fulfilling customs procedures) or for EEA products to enter Switzerland (without customs duties being handed over to Switzerland). A “market surveillance system” was set up to ensure that. So in this kind of solution, NI would be the analogue for Liechtenstein, while Great Britain would be the analogue for the Switzerland. 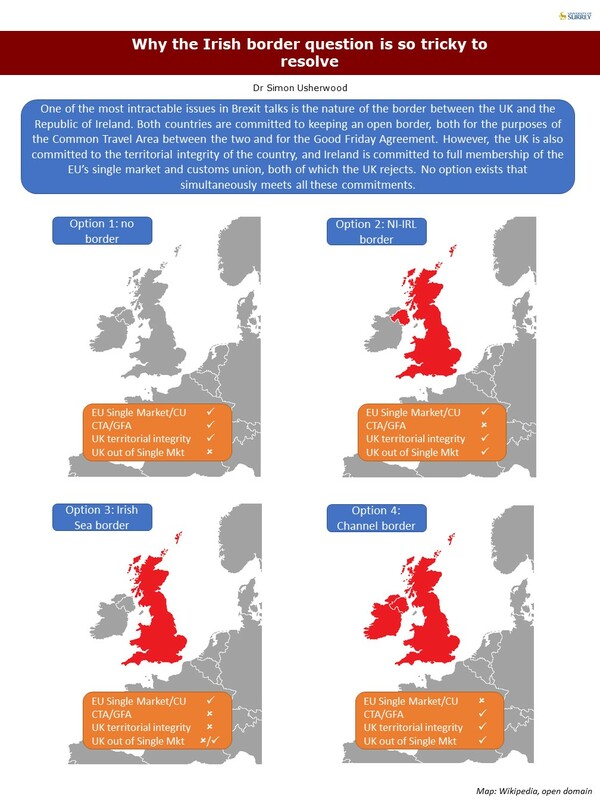 So NI would remain in customs union with Britain and the Crown Dependencies but it could have EEA law operating simultaneously (perhaps without the free movement of EEA nationals but only Irish nationals). In that way, free movement would be maintained for goods and persons and EEA goods could be traded freely in NI regardless of what the rest of the UK’s relationship with the EU/EEA is.